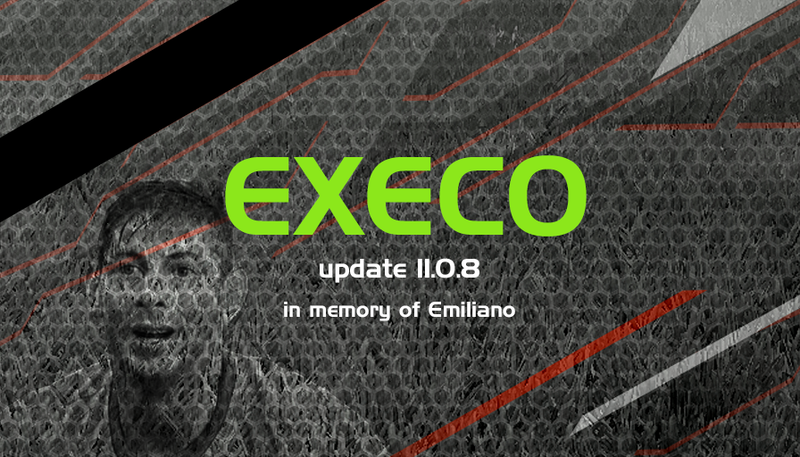 EXECO19 version 11.0.8 (for 2019) is available for download, read the release info of the update and the changes, always check for updates because we make enhancements regularly. south american teams are still under review, soon the market will settle down in that area and we will finish up the updates and add more south american teams soon. Does i need something except of 11.0.5 to install this patch ? as mentioned, all players imported from latest updates. Same problem. The game is stuck at Game Tips after pressing Kick Off. Still the same issue after Re-installing the patch. hey guys thanks again for the patch update and the great work. i have the original game, still some teams are not fully updated like SL. Benfica the equipment of the goalkeepers are wrong they are not blue... about the borrowed players to other teams in the original update they still in Benfica... i don't know if konami will update the teams in the next update or keep it like they have, anyway, please just have it in attention to produce the best patch ever correcting small little things but important things! thank you very much for the reply Fadi Alkam :) by the way another question: why your patch is not compatible with the online mode? would be great to have in online mode the teams with the correct logos and names! hello guys,there is a graphic problem in this patch,are not loaded some graphics in the menu and then game just doesnt load..
Did you add Emerson from Atlético Mineiro sir ? he is on loan for Real Betis now. thanks for the hard work!! Can you add more latin america teams and Mexican teams? in the next update? hello and thank you dear Smoke patches, as always you are simply fantastic. Big thanks for Omina for working on stadium server, i am very happy for this and not mind downloading extra gigabytes. Thank you again for you and all PES modders and patchers. Una consulta, instale algo mal o no viene con marcadores el parche? Por ejemplo de la libertadorse?? Gran trabajo!!! Thanks a lot, but I have one question, why Mourinho still in MU? and the live update of 14.02 will be compatible? Because in the live update of 7.2 Konami transfers are not complete. So does this contain the stadium server? Do I have to copy the file in download file and replace the old ones? Hi guys, thank you for your great work! After installing this update, I need to re-install the chants pack again? Why did not solve the old Trafford stadium problem? The name has been changed and the stadium is still different! When u r gonna convert database of PES 17 how r gonna change playing style like some players are orchestrator (Meyer, Arthur) in PES 19.How r u gonna do that? There are 2 Baresi. That of DP 4.0 is free players while the former is still in a team legend. Please fix the problem with bayer Leverkusen !!! there's no stamford bridge stadium yet. is there a way that we can use the default konami face instead of the facepack for some player? Bundesliga players doent load in edit. especially, Levekusen and maybe more.. That makes all players dont load in game and freeze. check them out. necesito la versión anterior para instalar esta ? No necesitas la versión original para instalarlo , desde la versión 11.05 puedes instalar esta. Before Install Full Patch I Will Delete Download Folder Or Not ? Hi, any reason why my MLS league are all generic fake teams? Also, new legends faces (like Nakata, Totti) are not being used? Nevermind, I did not install the update yet. Will update once I installed the update. Thank you for the hardwork on this! is the latest version of updates needed ? Thanks for great patch but can you in next patch fix faces a little bit in FK Crvena Zvezda because they look too randomly (SRDJAN BABIĆ is built like rugby player...) except M.RODIĆ, R.BOAKYE, G.ČAUŠIĆ, M.MARIN, M.JEVTOVIĆ, JONATHAN CAFU, M.GAJIĆ they are good. Some players are missing: Mirko Ivanić, Erik Jirka, Aleska Vukanović. D.MELEG, N.MILIC, D.SRNIĆ are no longer in the club. Kits and player icons are amazing except S.HAJDIN it's not him. Formation is set 4-4-2 although club always play 4-5-1. Where is Milinkovic-Savic from Lazio? Thanks Master Smoke. Now let's see later if you made it possible j. league to go. If it doesn´t at least add all those 2nd division teams in to Other (Asian Teams). pls help. I instalation last version patch and he writes me to version 1.04.00 , data 3.00. no winter transfers, no new stadiums, no new stats players. Soryy for me bad english. Hi guys, its asking me to create new edit mode data, i used to use PTE, do I need to delete all game files or what? You must be joking because this update doesn't come with the stadium-server. Maybe the exe update to 1.04 disabled it. SEAMAN face is terrible, same goes with VAN NISTELROOY ( use Master Steels one to replace the one you are using, it's way better ) and finally you should use the new Konami's BARESI instead of the face he has in game. is there any way i can change the jleague because i want to make my own league . 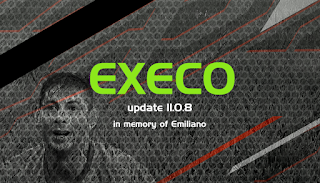 Not getting the Emiliano splash screen? Many thanks for the link. As a Cardiff City Season Ticket Holder it is nice to pay my respects to Emiliano every time i play your wonderful patch. Bye the way I have Stadium Server, Refereekit Server and ScoreboardServer all working well with your patch and the latest version of Slider. Not join the match in myclub and live update not work i install steam veraion why? All the modded jerseys are too bright, and they look like plastics. I can easily tell if which one is a mod and which one is Konami's official jersey. Can you please fix them? Really nice patch! There's a way to make it work with the online mode? Why has stadium server been disabled in this patch i lost all my stadiums now. Ok, then is not a problem with the patch,? Hi Smoke! Please tell me in the next update will be made by Sebastian Giovinco and will he be added to his MLS team? He got transferred to Al Hilal in Saudi Arabia, so no reason why he should still be at Toronto ingame. Thank you for the info on Giovinco player! Will you make him a face or will he be fake? a request, they could leave enabled the option to add a fifth kit. Transfers are outdated. Do you plan to update them? I can't proceed to the download page for any file. (Annoying) captcha completed, but there is no download link. WTF? after installing patch is there anyway i can change adboards replay logos etc bk to the original ones ?? and what turf packs are compatible with the latest smoke patch ?? 1.fix the collars for all the national teams which you added kits to as most of them are wrong. 2.use the correct numbers and fonts for the national teams and clubs (like addidas, puma, nike, Umbro) as most of the used are generic and incorrect. 3.update the kits for the national teams specially Asian . Could you, in the next update, make the lawn covering at Juventus FC a little darker? a very very bright coating, unlike other stadiums, is not green. Hello, I have version 11.0.5, can I install 11.0.8 or should I install the previous ones first? Thank you. Ty..excelent work.. I look forward to the South American patch! Whenever I start a new ML I'm having a hard time getting the correct boots to show up for players. What is the cause of this and how do I fix it?? To install this version I just need the 11.0.5 version or all the old versions? Whats wrong in my PES, after done install this part version i've got error at kick off.. Can you give me solution about that.. Thanks..